Wendy Toye was born in London on 1 May 1917, and at the age of three and a half appeared on stage at the Albert Hall in London as a member of a juvenile dance troupe. Her solo turn as part of the act brought her considerable publicity, and Toye began to perform in music halls and charity shows with many of the day's top stage stars. By the age of five she was working as 'stooge' for Hayden Coffin , the famous musical comedy star, on a regular basis. At the age of nine, she appeared at the Palladium in a ballet she had choreographed herself, entitled The Japanese Legend of the Rainbow, set to music by Scarlatti . The presentation was an enormous success, and Toye was soon much in demand, choreographing ballets and dance routines for numerous stage companies. She was invited to perform with Serge Diaghilev 's Ballet Russe, where she met the film-maker/artist Jean Cocteau . Toye later appeared at the Café de Paris, as a member of the Markova-Dolin Ballet Company, and gradually began doing more commercial work, such as choreographing routines for the Crazy Gang at the London Palladium . In 1931, she made her first film appearance, in Anthony Asquith 's Dance Pretty Lady , and in 1935 she appeared as Signora Picci in Paul Merzbach 's Invitation to the Waltz . But she was more interested in absorbing the technical process of filmmaking than in a career as an actress. By 1942 she was arranging the dances for The Young Mr Pitt (where she was befriended by director Carol Reed , editor David Lean , cameraman Ronald Neame and actors Robert Morley and Richard Attenborough ) and in 1946, she served as choreographer on Herbert Wilcox and Anna Neagle 's Piccadilly Incident . From the 1930s to the early 1950s, Toye remained a popular and dependable stage choreographer and director, working in both the UK and the US. In 1949, she directed the Broadway production of Peter Pan, starring Boris Karloff and Jean Arthur , which brought her additional acclaim. Around the same time, she met British producer George K. Arthur , who had purchased the rights to several short stories, and was casting about for the proper director to bring them to the screen. Toye expressed interest in one story, The Stranger Left No Card (1953), and was allowed to make it as a 23-minute film on a budget of £3,000. Precisely timed to a synchronised musical score, the film was a delightfully sinister parable, deeply influenced by Cocteau and René Clair . It impressed Alexander Korda sufficiently for him to offer Toye a contract. She displayed talent and imagination in directing the 'In the Picture' episode of Three Cases of Murder (co-d. David Eady, George More O'Ferrall, 1953), though she felt little enthusiasm for the routine crime films he then offered her. Nevertheless, she handled The Teckman Mystery (1954) with professionalism and efficiency. She felt more affinity with her next assignment, the domestic comedy Raising A Riot (1955), which was critically and commercially successful. In January 1956, Korda died of a heart attack, and Toye 's contract was shifted to Rank , where she made All for Mary (1955) with Kathleen Harrison , Nigel Patrick and David Tomlinson , and True as a Turtle (1957), a nautical comedy starring John Gregson , Cecil Parker , June Thorburn and Keith Michell . Both films did well at the box office, but Toye had to wait until 1962 for her next film assignment, We Joined The Navy , another seagoing comedy which boasted a cast which included Kenneth More , Lloyd Nolan , Joan O'Brien , Mischa Auer and John Le Mesurier . 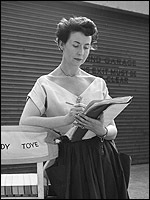 Toye 's last theatrical film was a short entitled The King's Breakfast (1963), after which she turned to directing television drama. In 1981 she made a colour, videotape version of the Stranger Left No Card for Anglia Television as part of the Tales of the Unexpected (ITV, 1979-1988) series, with Derek Jacobi in the title role; in 1986 she served as an associate producer on the TV movie Barnum! starring Michael Crawford . Although Wendy Toye complained that Rank refused to support her desire to direct projects more ambitious than her comedies, she took pride in the fact that she never went over budget, and that her responsible example paved the way for other women to enter the field. She continued directing stage comedies until the mid 1990s, when she retired, with a lifetime of work in the theatre and film to her considerable credit.